Ever wonder how a Want Ad for the job of “Parent” would read? Well, wonder no more, just head on over to ParentSociety.com where my latest article or rather ‘want-ad’ is running today. It might be good for a laugh (or cry). Yep – you got that right! Me too! I make my husband handle all the kids vomit but I am stuck with the laundry! Not yet, but it is on my list! That is definitely a ‘need-to-know” item!! You’ll be sharing, right? Or maybe there could be an interesting story plot/ setup? Oh dear lord I choked on a grape after reading that want ad. That add below it is a good one too although I don’t fully understand it. 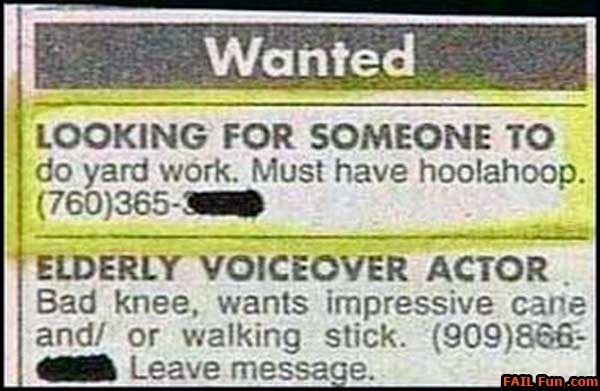 Are they looking for an elderly voice over actor who has a bad knee and is willing to work for an impressive cane? If so that’s pretty specific. Yeah, I was kind of at a loss on that one as well! Maybe it was a trick question?